Back in the day, my detractors at least attempted to encounter my arguments and debate me. They didn’t get too far. Since the publication of my new book Being in Time: a Post-Political Manifesto, they have changed their tactics: they insist on obliterating my international jazz career. 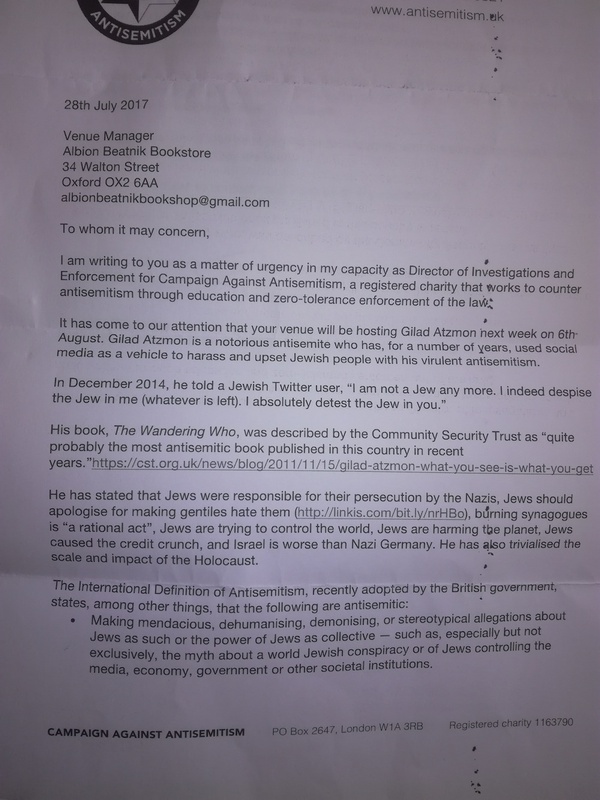 Earlier today, a book shop in Oxford that regularly hosts my concerts posted the attached letter (see below) to my Facebook page. 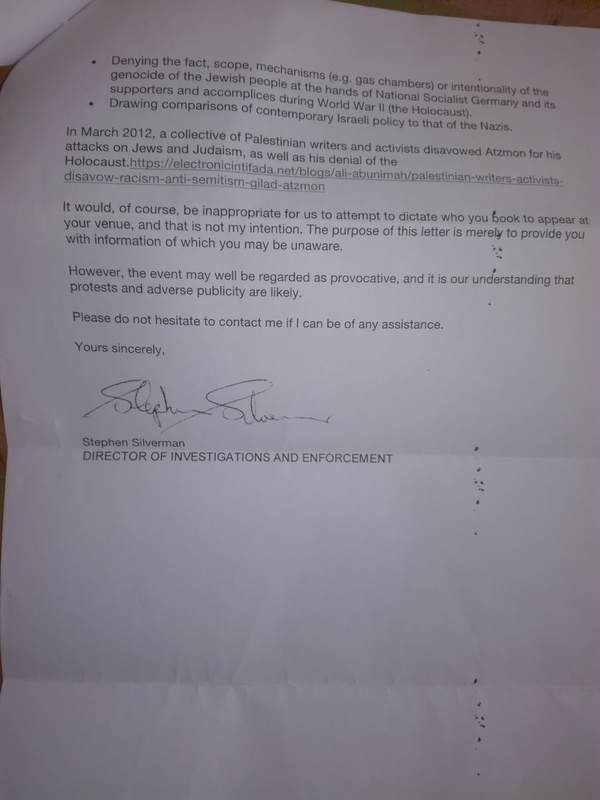 The Oxford venue received the letter from the ultra-Zionist Campaign Against Antisemitsm (CAA). The CAA letter is blatantly and intentionally defamatory and duplicitous. The CAA and other Zionist institutions have been busy subjecting every British jazz venue that features my music to intense harassment. It is no secret that Zionism has been destroying Palestine, its people and its culture for decades. However, eradicating British culture and British jazz in particular may be taking this carnage one step too far. A number of the British promoters, venues and festivals who received a copy of this defamatory letter against me attempted to investigate the CAA’s accusations and have found the allegations to be baseless, delusional and duplicitous. By way of illustration, the band I am touring with at the moment is led by a NY Jewish musician and the bass player is an ex- Israeli: not exactly a ‘Neo-Nazi’ quartet. My best selling book, The Wandering Who, which has been translated into 14 languages and was endorsed by a huge list of academics and humanists worldwide, is denounced in the CAA’s letter as “probably the most anti-Semitic book published in this country in recent years.” But the CAA possesses the legal means to stop the distribution of ‘antisemitic literature.’ In my case they face a real problem; my writings may be controversial, but they are ethically driven, call for a humanist introspective examination, and are well within the boundaries of the law in every country including Israel. It is noticeable that the CAA’s letter doesn’t provide links to my words. This is not a coincidence. My work is careful and measured. I never refer critically to Jews as a people, race, biology or a collective. I instead scrutinise the meaning of Jewish identity politics and ideology. I do believe that in a free society every ideology and politics must be subject to criticism. This is the only link the CAA provides to my work: http://linkis.com/bit.ly/nrHBo . Read my words and decide for yourself whether you agree or not. I define Jewish power as the power to silence criticism of Jewish power. At the moment the CAA and other Jewish organisations are mounting a campaign to suppress any form of legitimate criticism of Israel, Zionism and Jewish political lobbying in the West. Perhaps inadvertently, the CAA has affirmed my definition of Jewish power. They are desperate to suppress any possible criticism related to Jewish politics and ideology. 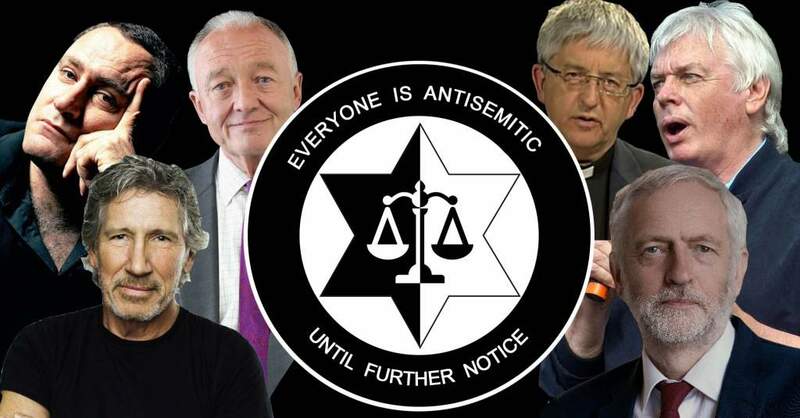 Roger Waters, Vicar Stephen Sizer, David Icke, Ken Livingstone and many others have been subjected to similar vile campaigns that are determined to eliminate basic freedom of speech in the UK. I do accept that the CAA and other Zionist organisations insist upon remaking Britain into their banana republic- a place deprived of freedom of expression, a country where dissenters are subject to constant threats and harassment. I suppose I could go along with the CAA’s vision of Britain so long as the CAA and its Zionist allies can also improve the weather and make the price of tropical fruits drop significantly.